While Darcy’s mother is out of town, Darcy is forced to stay with her grandmother and great grandmother. To their face she calls them Granny and Grandma, but in her mind they are always Misery and Batty. Darcy can’t believe her mother is abandoning her to Batty’s vagueness and Misery’s constant complaints and criticisms. Just when she thinks things can’t get any worse, Darcy has to complete a family history project for school focusing on the Second World War, a topic that is strictly forbidden in her grandmothers’ house. On top of that, Darcy becomes the victim of a nasty bullying attack at school. How will she survive the weeks her mother is away without going mad? 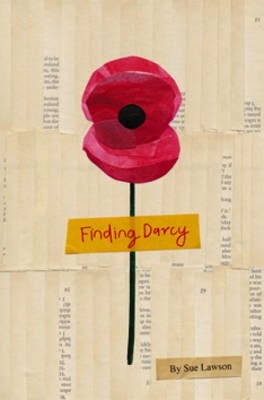 A beautifully written and touching book, Finding Darcy balances a very personal approach to Australia’s war history with topical issues such as bullying and body image. Despite the abundance of novels focused on the history of the two World Wars, Finding Darcy offers a fresh perspective on the impact of the war on those who remained at home and whose lives were thrown into chaos by the deaths of loved ones on the battlefield. While not condoning racism or the nastiness of Darcy’s grandmother, this story does offer a compassionate perspective on the long term emotional impact on those who lost their hopes and dreams when husbands, brothers, and sons didn’t return after the war. As Darcy gradually uncovers her family’s story, she views her grandmother and great grandmother with a greater sense of compassion and, as a result, her relationship with both changes for the better. The issues of bullying and body images firmly connect the story in a modern setting with emotions and challenges that readers will find more personally relevant. Finding Darcy encourages readers to view those who lived during the war years with a greater sensitivity and an increased appreciation for what they experienced. It may also stir their interest to know more about their own family wartime history. Highly recommended for teens and adults with an interest in war history as well as those looking for a touching story about family relationships.